Listen to your music wirelessly with the SR5BT, combining lightweight on-ear portability and precision design with Audio-Technica’s unrivalled sound fidelity. Remember up to 8 devices with integrated Bluetooth® technology and enjoy easy one-touch pairing with NFC (Near Field Communication). 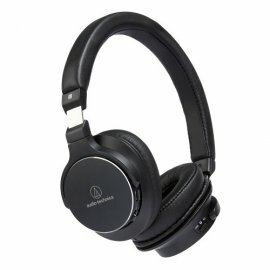 With a wired connection, you can also experience the superb clarity of high-resolution audio, delivered through specially designed 45mm drivers. Specially tuned 45mm drivers for experiencing outstanding high-resolution audio via a wired connection. Combining a lightweight on-ear design and soft memory foam earpads and headband to deliver an enhanced fit. Listen to your music wirelessly for up to 38 hours on a single charge. PLAY/PAUSE, VOLUME, SKIP controls are integrated into the earcup allowing you have complete control of your music.